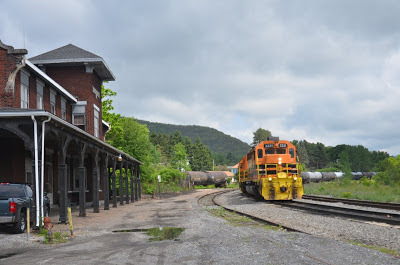 On Saturday I decided to spend some time out in Bloomsbury to see what was on NS's Saturday morning schedule along the LEHL in addition to sharpening up my photography skills for August's "Lehigh Limited" excursion at this location. First train through was 11J and its consist of empty autoracks. Even though I am not thrilled at seeing graffiti on any surface, the artwork that is sometimes seen on these autoracks is very artistic. It makes me wonder why not apply those skills to a canvas on an artist's easel? With that being said, I shall step down off my soapbox and mention the next train I saw passing by at Bloomsbury's MP 68.8. 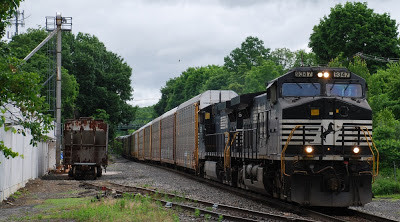 It was eastbound NS 67J with it's consist of empty GOFCs (Garbage On Flatcar Container). Thank goodness those containers were empty since summer's warm temperature would have meant I got "wind" of that train's passing. Thomas Just 2 Weeks Away! Some Trips Sold Out! Received the following via email from The Delaware River Railroad Excursions. A Day Out With Thomas is only 2 weeks away! Trips are selling out, get your tickets today! A Day Out With Thomas in Phillipsburg, NJ is just 2 weeks away. Trips are selling out, please buy your tickets today so you don't miss out on all the fun! The Day Out With Thomas In Phillipsburg New Jersey has the best entertainment anywhere! 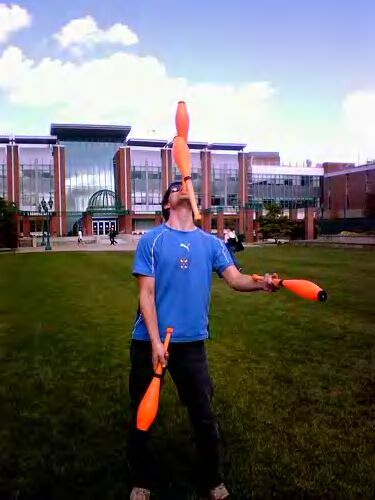 We have TWO huge inflatables ( a pumpkin and an obstacle course), a Petting Zoo, The Amazing Joe Showers Juggling every hour, The Grand Master Bandwagon playing every hour, the Nazareth Area Society of Model Engineers train layout running all the time all days, Imagination Station ( temp tattoos, SPIN ART, Mega Blocks, Coloring, Stamps etc. ), Thomas Videos, meet and greet with Sir Topham Hat, Great Carnival Food And of course Thomas himself! You can also go for a ride behind Steam Locomotive #142 and ride down to the Ol' Susquehanna Mine and pan for real gem stones! Please see our post below dated Sunday, June 23, 2013, for details. NS bulk transfer terminal opens in Columbia, S.C.
COLUMBIA, S.C. – Norfolk Southern has opened a new Thoroughbred Bulk Transfer terminal in Columbia. Located less than two miles from I-26 and near Columbia Metropolitan Airport at 1861 Old Dunbar Road, West Columbia, the terminal can handle dry and liquid bulk commodities such as flour, sugar, and plastic pellets, as well as aggregates, steel, and lumber. It features five acres of paved lay-down area, a certified truck scale, and is fully fenced and lighted. Markets served by the terminal include the Columbia area as well as points east such as Darlington, Florence, Hartsville, Orangeburg, and Sumter. 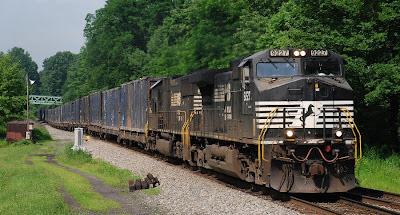 Norfolk Southern has a network of 31 TBT facilities in 17 states. The new Columbia terminal is operated under license by RSI Leasing Inc. More information on Norfolk Southern’s transload network is available at Norfolk Southern Distribution Services. JACKSONVILLE, Fla. - June 17, 2013 - CSX Corporation (CSX) today announced it has been named one of the "100 Best Places to Work in IT" by IDG's Computerworld. At number 19, CSX was the highest-ranked transportation company to be recognized for its commitment to creating a challenging and supportive work environment for IT employees along with competitive benefits and compensation. "At CSX, we believe that people make the difference," said Kathleen Brandt, CSX Technology president. "Our continued success is built on an engaged workforce and each employee's dedication to providing excellent service. CSX's IT professionals bring passion to their work and help serve our customers through delivery of reliable information and technology solutions." Among CSX IT staff's contributions to efficiency and customer service are integrated solutions designed to provide transparent, real-time notifications of customer requests and expectations. "We applaud the organizations on the Best Places to Work in IT list for creating and sustaining dynamic IT work environments," said Scot Finnie, editor-in-chief of Computerworld. "It's clear that the best IT workplaces are constantly raising the bar with great benefits, new learning opportunities, access to cutting-edge technologies and challenging business-critical projects." The 100 Best Places to Work in IT list is an annual ranking of the top work environments for technology professionals by IDG's Computerworld. The list is compiled based on a comprehensive questionnaire highlighting company performance in categories such as benefits, diversity, career development, training and retention. In addition, Computerworld conducts extensive surveys of IT workers, and their responses factor heavily in determining the rankings. The full list for 2013 can be found at http://www.computerworld.com. JACKSONVILLE, Fla. - June 17, 2013 - CSX Corporation (NYSE:CSX) today released its 2012 Corporate Social Responsibility (CSR) report detailing the company's environmental, social, governance and financial performance. The full report is accessible at the company's microsite, www.CSXCSR.com, which highlights CSX's sustainability and corporate citizenship efforts in action. "At CSX, we are committed to the relentless pursuit of excellence," said Michael J. Ward, chairman, president and chief executive officer. "Operating a sustainable, transparent company is an important element of this commitment, and our CSR report demonstrates how we put these values into practice. 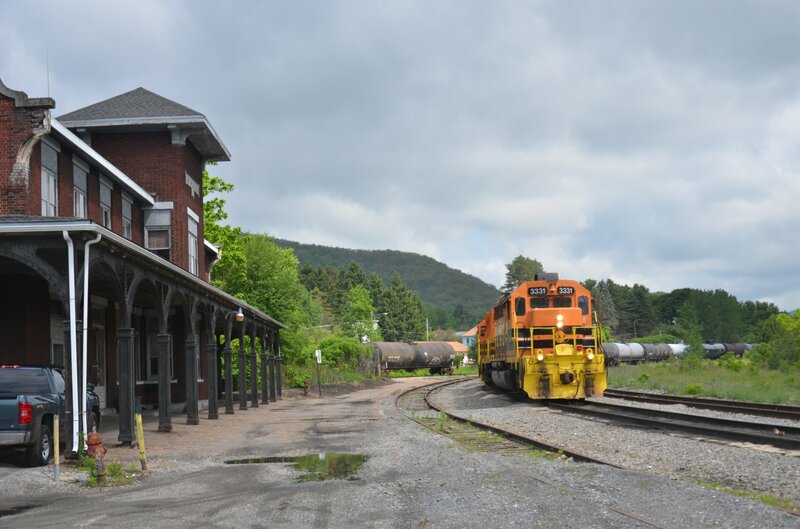 It's also evidence that CSX's environmental stewardship and employee and community engagement work in tandem with our continued strong financial and operational performance." - Training nearly 30,000 employees in environmental stewardship programs. - Partnered with numerous national and local organizations, including City Year, Future Farmers of America, National Safe Place, Dignity U Wear, Alliance for Community Trees and The Nature Conservancy, as well as public-private partnerships, like the innovative, ongoing High Line project in New York City. Detailed in the report is CSX's continued focus on fostering profitable, responsible growth, delivering strong financial performance for its shareholders. CSX made capital investments of $2.3 billion in 2012, including investments related to public-private partnerships, in its network to ensure the company's ability to continue delivering excellent customer service. CSX plans to make capital investments of $2.3 billion in 2013 as well. The report also provides an insightful look at CSX's business markets, including a detailed review of the diverse portfolio of products transported over its network. "CSX's CSR report is both a comprehensive review of the past year and our guide for the future," Ward added. "Our goal is to use this report to engage further in important conversations with our stakeholders about how CSX can continue to be a leader in sustainability in 2013 and beyond." CSX's 2012 CSR report was prepared in accordance with the Global Reporting Initiative (GRI) G3.1 Sustainability Reporting Guidelines, and is self-declared to be a GRI Application Level B report. GRI is a globally recognized reporting framework for environmental, social and governance performance. The content and direction of the report was informed, in part, by the issues and concerns raised during the company's ongoing engagement with employees, customers, investors, community and NGO partners, regulators and suppliers. Saturday, July 27th. 2013 at 2:00p.m. 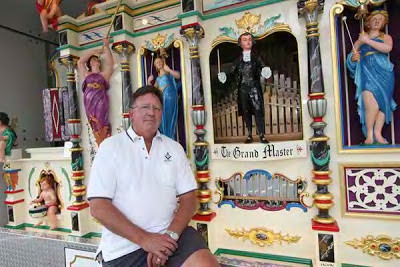 Rob Pisani, Vice-President of Atlas Model R.R. Co. Arrangements being finalized, details will follow. If you have a layout in the area and would like to show it off drop us an e-mail. Note: We have not been able to reproduced the Flyer mentioned above on this blog. For more information about this event please see the following web site: http://www.nergsd.com/dinner.html. Unfortunatly, this web site only contains some of the information that is in the Flyer; but it does tell you how to register. 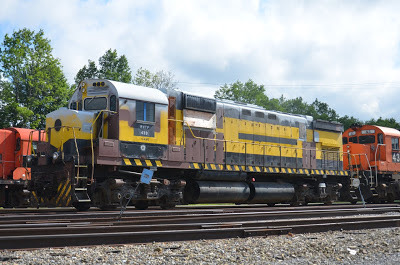 When I was made aware that the NS Lehigh Valley heritage unit would be leading NS's 18N autorack train, visions of my photographing another heritage unit appeared before my eyes. The weather forecast called for sunny skies and pleasant temperatures for its passage through NJ hopefully during the midday hours. Such was not the case to be as "Murphy's Law" took over. 18N ended up being delayed at various spots along its route causing it to pass through Central NJ after 7 PM under cloudy skies. 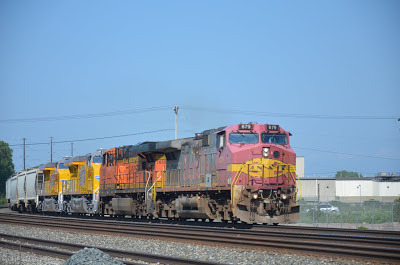 The final straw for me was when it was held at MP 62 on the LEHL for a westbound intermodal to pass. By that time my hopes had faded as fast as the sun sinking in the west. But it wasn't a lost outing for me. I did manage to get eastbound NS 202 and NS 33K at Bloomsbury (LEHL MP 68.8). 33K was holding on the siding while waiting for 202 to pass. For consolation prizes, these two were not so bad but ohhh... the one that eluded me. JACKSONVILLE, Fla. - June 19, 2013 - CSX Corporation (NYSE: CSX) will release second-quarter financial and operating results on Tuesday, July 16, 2013, after the market close. The company will host an earnings conference call at 8:30 a.m. Eastern Time on Wednesday, July 17, 2013 via teleconference and a live audio webcast. Took a little trip (6-14-13) with Matt Glogowski down to the WNYP in Olean...got the newest C430, although not yet in service. Over to Erie and thanks to a heads up from Chris Southwell, got a nice shot of a ATSF (BNSF) warbonnet leading train 309 west on the old NKP. 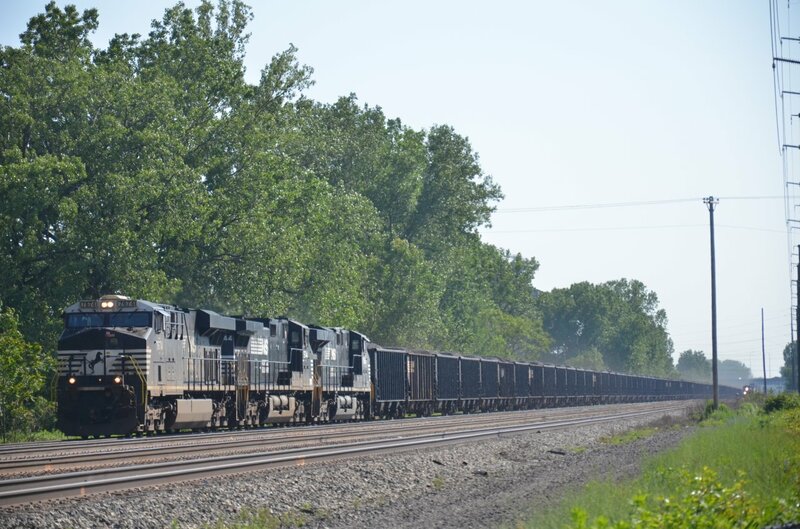 Also got shots of a NS coal train in Erie. See what we get tomorrow!!! Received the following via email from Kermit Geary Jr. Text, photos, and captions are his. 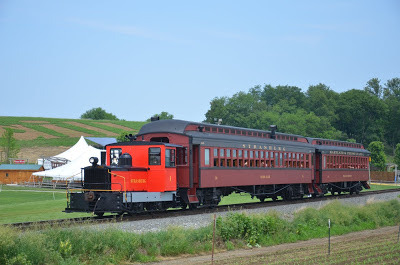 Strasburg RR 181st Birthday today (6-9-13). Founders Day Celebration included a couple of runs with their first locomotive, a 20-Ton Plymouth from 1926. 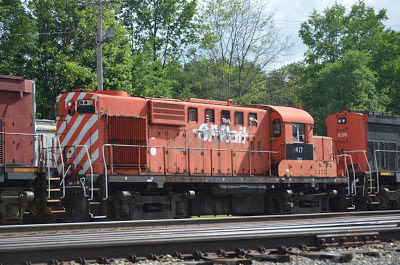 Sporting a fresh coat of paint, old #1 proved to be cantankerous during the two trips it made over the railroad today. Strasburg's ex N&W 475 provided the alternating service. JACKSONVILLE, Fla. - June 12, 2013 - CSX Executive Vice President and Chief Financial Officer Fredrik Eliasson today discussed the company's financial track record and long-term expectations with analysts at the Deutsche Bank Global Industrials and Basic Materials Conference in Chicago. "We have sustained strong financial performance through challenging business conditions over the past five years, with consistent improvements in operating income, earnings per share and operating ratio," Eliasson told analysts. As previously stated, the company expects earnings per share to be flat to slightly down from 2012 levels, with growth in the intermodal and merchandise businesses, which represents about 80 percent of the company's business, helping to offset declines in its coal market, which is in the second year of a two-year transition period. Going forward, the company expects average annual earnings per share growth of 10 to 15 percent off of its 2013 base, and is targeting a high-60s operating ratio by 2015, with a continued focus on achieving a mid-60's operating ratio longer-term. Underscoring the company's confidence in driving long-term profitable growth, Eliasson also reiterated CSX's guidance in deploying cash for shareholders, including a shareholder dividend increase, a new billion-dollar share repurchase program over 24 months, and capital investment of $2.3 billion this year. In addition to his Deutsche Bank discussion, Eliasson recently appeared on the "Bloomberg Surveillance" television and radio program to discuss the renaissance in the rail industry and CSX's balanced approach to creating shareholder value. To view the interview, visit http://www.bloomberg.com/video/u-s-oil-boom-boosting-railway-growth-csx-cfo-says-Wl0YaR8OS8S4w5~g8dsvtQ.html. For more information about CSX's growth and balanced capital approach, visit http://investors.csx.com/phoenix.zhtml?c=92932&p=irol-irhome. Don't Forget DAD $10.00 off the Wine train this weekend! Father's Day Weekend - DAD RIDES FREE! On the weekend of June 15th & 16th Dad rides free! 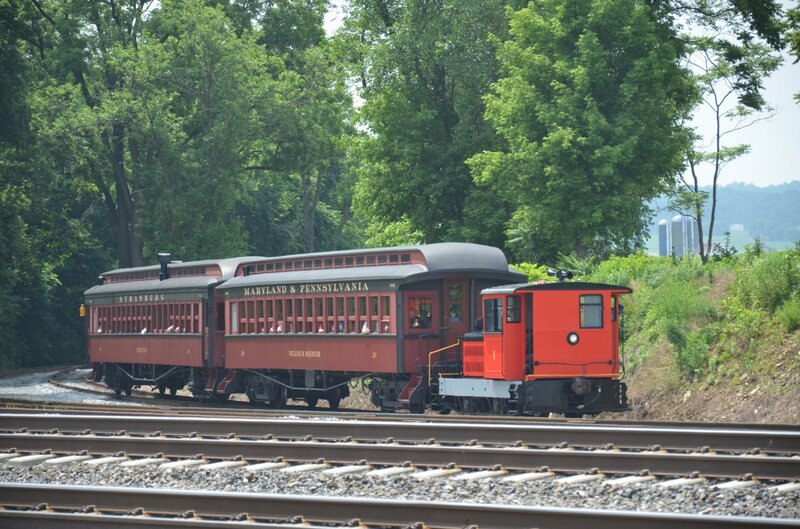 Take your Dad for a ride on our historic train for a beautiful journey along the scenic Delaware River. The Scenic Train ride is free, and if you wish to visit the Ol' Susquehanna mine, and pan for Gemstones, that's only a $5.00 upgrade. To buy tickets for fathers day, purchase yours online and simply bring dad along! Mine upgrades can be purchased in person when you arrive at the ticket booth! 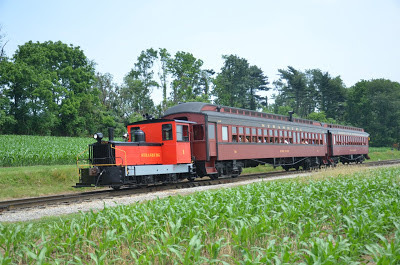 Take Dad on the Warren County Winery Train and take $10.00 off Dad's ticket! use discount code "dad" at check out! If more than two dads are coming along, there must be one ticketed passenger per dad. Please create two separate orders on our online system as it will only allow one dad per order. Enjoy a beautiful journey along the scenic Delaware River behind New Jersey's only operating steam locomotive. 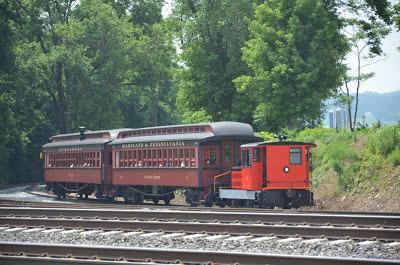 The Warren County Winery Train is operated by the Delaware River Railroad Excursions located in Phillipsburg, New Jersey. We are a Non-profit, 501 (c) 3 corporation and staffed almost entirely by volunteers. After a Steam Train ride along the Delaware and a short bus ride through rolling farmlands, you will arrive at Villa Milagro Vineyards (www.VillaMilagroVineyards.com) . There you will learn how grapes are grown and made into wine. Then you will sample their delicious wines and have an opportunity to purchase them at the source. If you would like to enjoy your wine with a picnic, bring a lunch and relax at tables in tree groves at the Ol'Susquehanna Mine and Corn Maze or at the station in Phillipsburg. You are welcome to detrain at the Mine and spend as much time as you like relaxing in the picnic grove then catch a later train. All tickets on sale now! Steam locomotive #60 will be pulling our Summer Excursion trains this weekend, June 15-16. Round-trip trains depart Flemington Station at 11:30 AM, 1:00 PM, and 2:30 PM. Tickets are first-come-first-serve. Reservations are not available. Children under age 3 ride FREE. Children ages 3-11 are $7. Passengers age 12+ are $14. 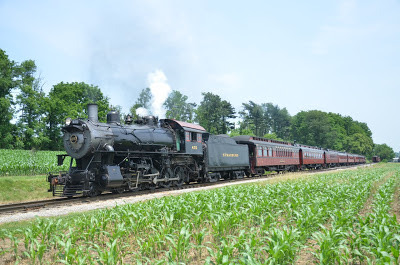 Come celebrate Father's Day with a relaxing steam-powered train journey through Hunterdon County! Click Here For Additional details on our Summer Excursions! 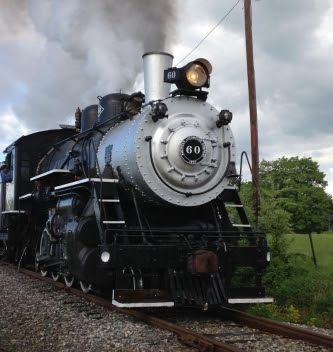 Click Here for additional information about steam locomotive #60! For information about additional events on the Black River & Western Railroad please see our posting below dated Friday, June 07, 2013. GREENCASTLE, PA. – Norfolk Southern CEO Wick Moorman and U.S. Rep. Bill Shuster joined federal, state, and local officials today to officially dedicate the Franklin County Regional Intermodal Facility. The $97 million terminal, located on 200 acres south of Greencastle and less than a mile from Interstate 81, connects Central Pennsylvania, Western Maryland, and Northern Virginia to domestic and world markets while creating 126 jobs at the site. The facility, a public-private partnership involving $52 million in NS funds and supported by a $45 million investment by Pennsylvania, is part of NS’ Crescent Corridor series of projects, a 2,500-mile network of rail and terminals that helps moderate truck traffic on congested roadways and reduce carbon emissions. The terminal, with its 670 paved trailer/container parking spots, will be a major gateway for freight in the Mid-Atlantic. 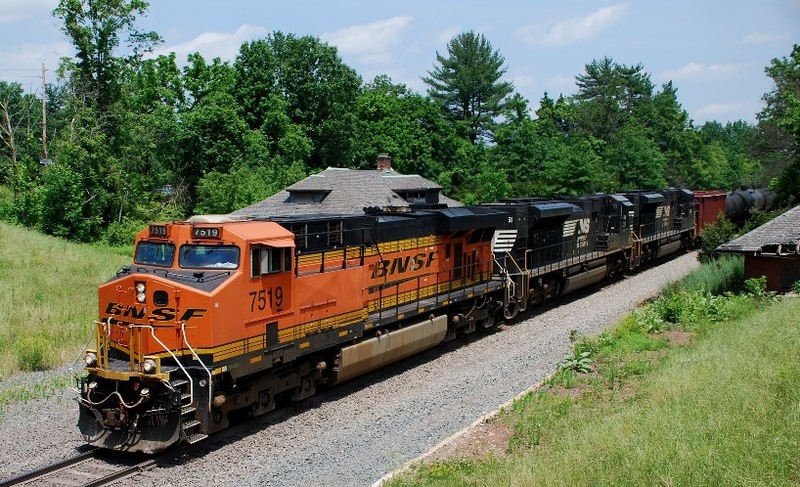 NS projects that the new facility, in combination with other NS intermodal terminals in the state, will help divert hundreds of thousands of long-haul trucks off roadways in Pennsylvania and onto trains. "This intermodal terminal is a huge investment in Franklin County's future,” said Shuster, chairman of the U.S. House Committee on Transportation and Infrastructure. “These facilities are proven centers of business growth, and I am sure it will create many opportunities for Franklin County and the region. I have long supported freight rail because of its efficiency and see this terminal as a vital infrastructure improvement." NS constructed the facility’s administration building to meet Leadership in Energy and Environmental Design (LEED) certification standards. The railroad is incorporating terminal automation in order to maintain air quality and support truck drivers. The Franklin County Regional Intermodal Facility is the third Crescent Corridor intermodal terminal NS has opened since mid-2012, with facilities in Birmingham and Memphis having started last year. A fourth Crescent Corridor intermodal terminal, located in Charlotte, will open later this year. NS also is expanding capacity at two intermodal terminals in Harrisburg. JACKSONVILLE, Fla. - June 11, 2013 - Expansion in domestic and international intermodal markets will help to drive continued long-term profitable growth at CSX, the company's Chief Financial Officer Fredrik Eliasson told analysts today at the 2013 Cowen and Company 6th Annual Global Transportation Conference in New York. "Our network serves nearly two-thirds of the nation's population and is well-positioned to capture a significant share of the domestic intermodal market opportunity, estimated at about 9 million total loads in the eastern United States," Eliasson said. "Investments in expanded capacity will help convert this long-run opportunity, building on about 30 percent growth in our intermodal business over the last three years." 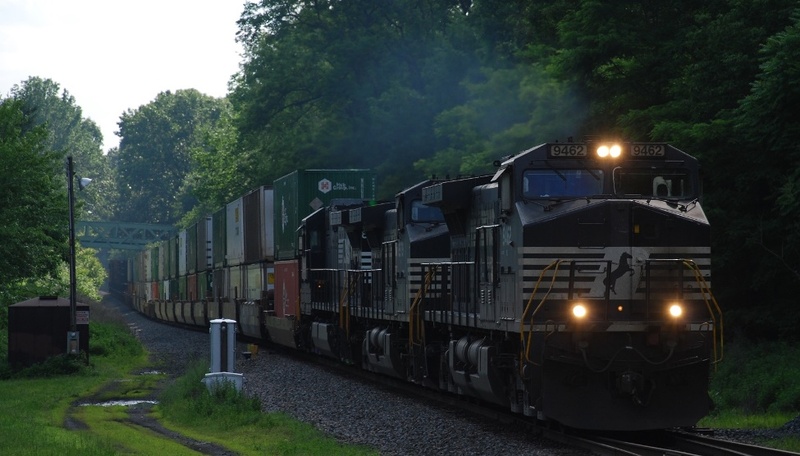 CSX shipped 2.5 million intermodal containers in 2012, with 90 percent of that traffic in double-stacked service. 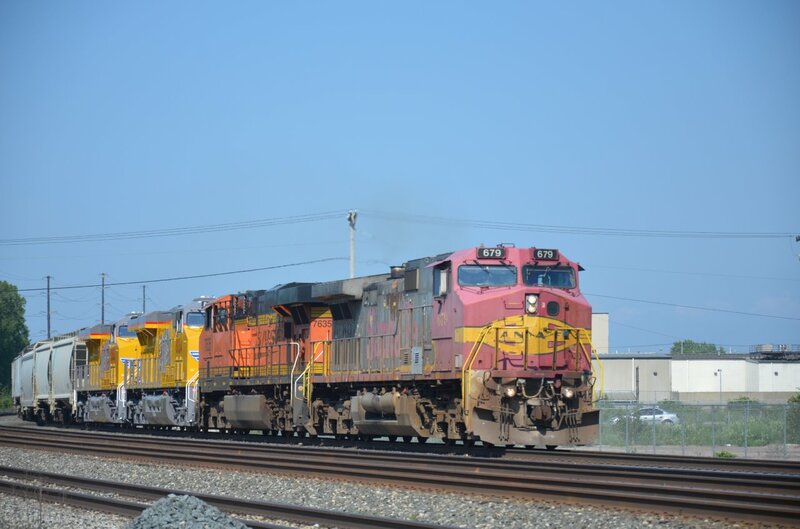 The company continues to invest in capital projects to expand its intermodal network, which will further increase double-stacked corridors by 2015 with hubs aligned with major ports and population centers. Started out Sunday by wondering where I should go trackside for a few hours. BR&W was running their steam engine which sounded like a good way to spend part of the afternoon. Prior to leaving, checking the internet to see what was running on either NS's Lehigh Line or CSX's Trenton Line. There was a thread about a CSX oil train that has BNSF 7519 as its leader, NS 1051 and NS 1011 as its motive power. That thread also started that it departed Kearny (NJ) at 11:40. 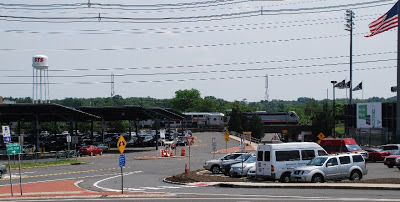 With that information, it was off to my favorite haunt along the Trenton Line, the former Reading Station in Belle Mead. Around 12:37, the block signal turned green for a westbound train. K040 was finally on the Trenton Line. Seen here passing the station, this image has four major railroads in this scene. The tarcks are CSX, a BNSF and two NS desels provide the motive power and the station represents the Reading! Back in October, 1971 after Tropical Storm Doria flooded the Bridgewater area, I snapped this photo, taken with a Polaroid 60-second camera, of Cyanamid to capture the storm's damage in my area. Back then the Cyanamid train station, it can be seen to the left of the bridge, was a simple corrugated structure. Off to that bridge's right was the employee parking lot for the Cyanamid's hourly employees. The salaried employees parking lot was off to the left in that photo. 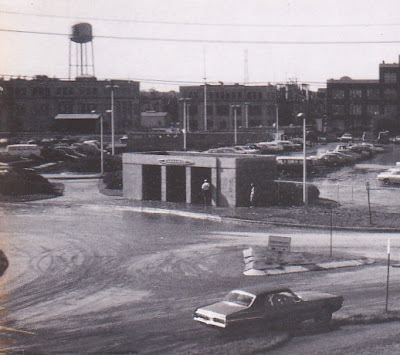 A concrete shelter adjacent to the traffic circle was for employees and served as a bus stop for employees who used public transportation for their daily commute. That water tower seen off to the left in the background advertised Sherwin-Williams paint company location. Their logo of paint spilling out of a can to cover the globe had their slogan "Cover The Globe" and was a prominent landmark in the area. It is now June 9, 2013 and the Cyanamid plant site is now vacant land in addition to being a faded memory. 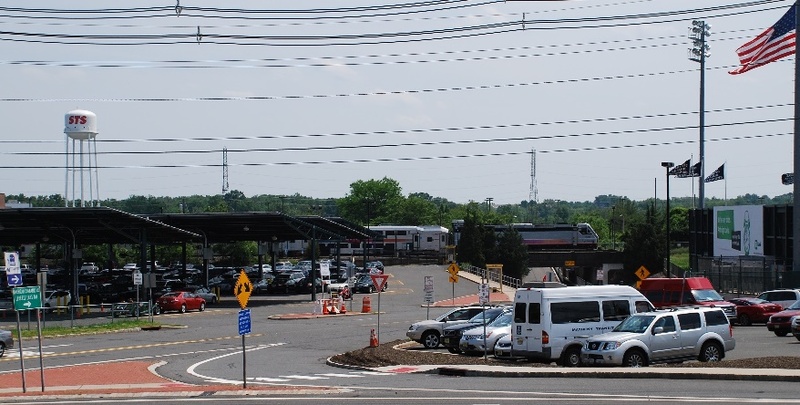 The Cyanamid corrugated train shelter for passengers is long gone, replaced with a modern facility and regular stop for NJT's Raritan Valley Line trains. That hourly employee parking lot is now the home field TD Bank Ballpark for the Somerset Patriots baseball team. When this image was snapped, the Patriots were losing to the Sugarland Skeeters by a score of 3 to 1 in the third inning. The Patriots would eventually lose this game by a score of 6 to 3. Those solar panels seen in the former salaried lot are part of the 3,465 panels that provide an alternate power source that supplements eighty-eight percent of the electrical consumption at this ballpark. That salaried parking lot is now referred to as the White parking lot and serves both NJT commuters and baseball stadium for parking. Finally the Sherwin Williams tower now has "STS" and stands for Somerset Tire Service, the company which now occupies the former site of the Sherwin-Williams facility. 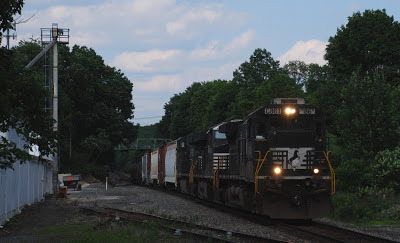 After Tropical Storm Andrea's four inches plus of rain finally stopped, I headed out to Bloomsbury, NJ (MP 68.8) to see what was running on NS's LEHL. The only two trains that passed by my location while I was there was NS 212 @ 9:05. Motive power was NS 8407, NS 9591 and NS 9496. Forty-five minutes later, westbound 11J, with NS 9347 and NS 9218, would pass by with its consist of empty auto racks destined for Oak Wood, MI. Having the filtered sunlight enabled me to capture a image of 11J passing by Agway, something that is not always possible for morning westbound trains here. Steam locomotive #60 will be pulling our Summer Excursion trains this weekend, June 8-9. Come celebrate summer with a relaxing steam-powered train journey through Hunterdon County! Don't forget, tickets are now available for our Caboose Hops, which operate every Saturday evening in July. Saturday July 6, 2013 to Saturday July 27, 2013 Ride a train made up entirely of cabooses all the way from Ringoes to Three Bridges and back! Reservations required. Saturday June 1, 2013 to Sunday August 25, 2013 The Deluxe Charter package includes exclusive use of our club car "John L Bishop" for your party of up to 40 people. Your party will depart RINGOES STATION at 10:45 AM for a round-trip ride to Flemington. 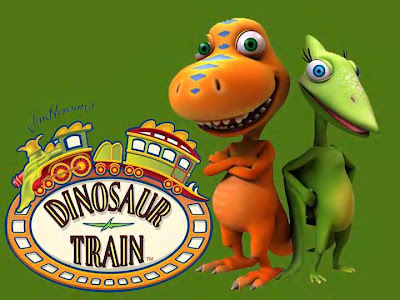 Your train will return to Ringoes at approximately 12:00 PM, and your private car will be switched to a side-track at Ringoes Station where you can continue your party for one additional hour. Restrooms are not available on board the train (restrooms ARE available at Ringoes Station). This historic train car is not air-conditioned. For additional information please contact charters@flemingtontrain.org. Saturday July 6, 2013 to Saturday July 27, 2013 The Saturday Night Deluxe Charter package includes exclusive use of our club car "John L Bishop" for your party of up to 40 people. Your party departs RINGOES STATION at 6:00 PM for a round-trip ride to Three Bridges. Your train returns to Ringoes at approximately 8:15 PM. Restrooms are not available on board the train (restrooms ARE available at Ringoes Station). This historic train car is not air-conditioned. This package does NOT include additional time after the train returns to Ringoes Station. For additional information please contact charters@flemingtontrain.org. Saturday June 1, 2013 to Sunday August 25, 2013 The Stationary Charter package includes exclusive use of our club car "John L Bishop" for your party of up to 40 people from 2:00 PM until 4:15 PM. The car will be parked on a sidetrack at Ringoes Station, so you will have convenient access to restroom facilities. This package includes five guest passes for a round-trip ride to Flemington and return. Additional tickets may be purchased at Ringoes Station. This historic train car is not air-conditioned. For additional information please contact charters@flemingtontrain.org. Important: This package does not include a train ride for your entire party. Black River Railroad Historical Trust uses Vendini for ticketing, marketing, and box office management. JACKSONVILLE, Fla. - June 5, 2013 - Fredrik Eliasson, CSX Corporation (NYSE: CSX) executive vice president and chief financial officer, will address the Deutsche Bank Global Industrials and Basic Materials Conference in Chicago, Wednesday, June 12, at 8:40 a.m. Eastern time. JACKSONVILLE, Fla. - June 3, 2013 - Officials from CSX Corporation (CSX) and its transportation and intermodal terminals subsidiaries today joined officials from the City of Salaberry-de-Valleyfield and the Province of Quebec at a formal groundbreaking ceremony for the new intermodal terminal in Salaberry-de-Valleyfield. Construction began in March and the terminal is expected to open in 2015. The $107 million project will expand CSX's presence in the market and connect the greater Montreal region and Quebec with CSX Transportation's 21,000 mile rail network in the United States. CSX Intermodal Terminals Inc. president Wilby Whitt joined Salaberry-de-Valleyfield Mayor Denis Lapointe and other invited guests to turn the ceremonial shovel of dirt at the site of the 89-acre future terminal. The new terminal will enable shippers in the region to capitalize on the economic and environmental benefits of intermodal rail, expand on the north-south trade opportunities offered by NAFTA, and connect to new markets. When fully operational, the terminal is expected to handle up to 100,000 containers per year, using modern rubber-tire gantry cranes to transfer containers between trains and trucks. "We believe the intermodal terminal we are building here will quickly become a positive asset for Quebec and the Salaberry-de-Valleyfield community for years to come," said Wilby Whitt, president, CSX Intermodal Terminals. Trains serving the terminal will connect through CSX's Northwest Ohio intermodal hub, offering quick and efficient access to markets across the United States. Roxboro Excavating Inc, based in Dorval, Quebec, is the lead contractor on the project. The work is expected to create about 600 jobs as it proceeds and the terminal is expected to lead to the creation of more than 300 permanent jobs. Located in the Perron Industrial Park, the terminal will be close to the newly-completed Autoroute 30, providing easy market access to the greater Montreal distribution and consumption market. As part of the project, the province of Quebec and Salaberry-de-Valleyfield are making improvements to the road network in the immediate vicinity of the terminal. The Quebec Ministry of Transportation is also supporting the project through a $6 million grant for the reduction of greenhouse emissions. CSX is also relocating a portion of its track from a residential area of Salaberry-de-Valleyfield to a location east of Autoroute 530 along side the new terminal in the industrial park. Once the track is relocated, the right of way will be sold to the city of Salaberry-de-Valleyfield for recreational use. CSX is proud of its 125-year history in Quebec, dating to the St. Lawrence and Adirondack Railway Company. This is basically an ad for a concrete services company, but involves the construction of a new railroad bridge in Kentucky. Note: click on a picture to see it enlarged; then use your browser's BACK button to return here. ﻿﻿ Both bridges span a gorge and historical stage coach trail connecting Louisville, Kentucky and Nashville, Tennessee. The old bridge was originally designed out of wood but was destroyed by fire during the Civil War. 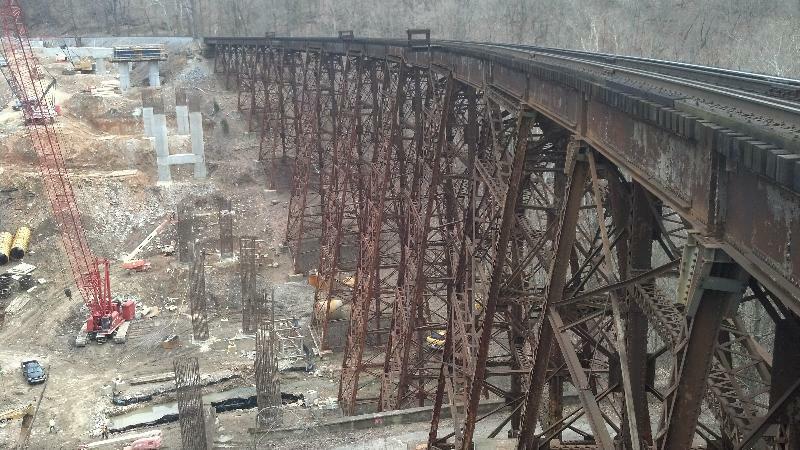 The rebuilt bridge was constructed of metal in 1890 and will remain intact preserving its historical significance. A new bridge was being constructed by Haydon Bridge Company, Inc. of Springfield, Kentucky to replace the old metal bridge structure. A testing company sent sonar waves through the sides of a bridge pier and found an issue at the 42 foot mark. A sample of this material was needed from the bottom 2-3 feet of concrete which interfaced with limestone. 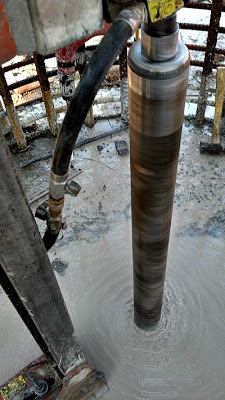 Ohio Concrete Sawing & Drilling, Inc. - Dayton Division was contacted by Craig Myers from Hayes Drilling, Inc. in Georgetown, Kentucky to core drill a 3 inch diameter hole a total of 45 feet into the bridge pier and continue on into hard limestone. 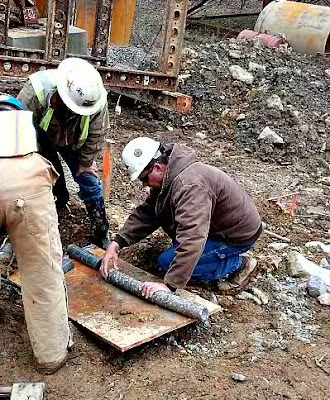 We were able to drill this depth by using segments of tubing with threaded barrels attached to a threaded diamond-tipped core bit to extend the length of the core until we reached the required 45 feet. The first day of drilling produced a 24 foot core. The second day of drilling produced a 20 foot core. 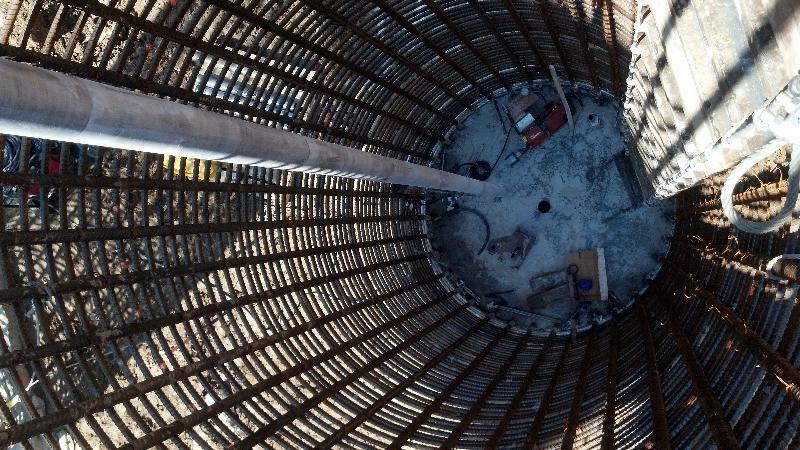 At the end of the second day of drilling, the crane pulled the whole 45 feet of core bit and the final 20 feet of core from the hole all at once. Craig Myers retrieved the last 2 feet of core at the bottom of the pier. Through thorough analysis, the core checked out. The previous bad reading was an anomaly. The actual drilling time to the 44 foot mark, minus any down time, was 7 hours. The schedule was important because a photographer from a structural engineering firm flew in to photograph the caisson and had to catch a flight to another project the next morning. 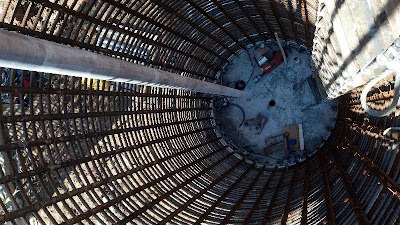 Please visit our website at www.ohioconcrete.com or call us today and allow us to solve your concrete cutting and drilling needs on your next special project. JACKSONVILLE, Fla. - June 4, 2013 - Fredrik Eliasson, CSX Corporation (NYSE: CSX) executive vice president and chief financial officer, will address the Cowen and Company 6th Annual Global Transportation Conference in New York City, Tuesday, June 11, at 9:10 a.m. Eastern time. NORFOLK, VA. – John P. Rathbone, executive vice president finance and chief financial officer of Norfolk Southern Corporation, will address the Cowen Securities Global Transportation Conference in New York at 2:35 p.m. EDT on Tuesday, June 11, 2013. Interested investors can listen via simultaneous webcast at http://wsw.com/webcast/cowen12/nsc/. The presentation will be posted at www.nscorp.com. NORFOLK, VA. – Norfolk Southern will honor more than 200 wounded military veterans Saturday, June 1, when they stop in Norfolk, Va., as part of their week-long “Ride 2 Recovery” memorial challenge. Ride 2 Recovery is a rehabilitation program of the Fitness Challenge Foundation that features cycling as its core activity. Bikes are specially designed to suit individual needs. The 325-mile bicycle journey conditions veterans while helping them overcome the physical and mental challenges they face after returning from service. Participants began their ride on Memorial Day in Arlington, Va., and will finish June 1 in Virginia Beach, Va., with stops along the way in Manassas, Fredericksburg, Richmond, Williamsburg, and Norfolk. Norfolk Southern employees will host a rally at Harbor Park near the Amtrak Station to support and welcome the veterans. The NS Cycling Team will ride with the veterans for a portion of their trip. NS Thoroughbred Volunteers will break from their participation in Clean the Bay Day to join the veterans as well. James A. Squires, NS executive vice president administration and an Army veteran himself, will address the attendees and introduce guests, including a number of mayors from the Hampton Roads area. The NS Veterans Locomotive will be staged at the event for a photo op, after which its horn will announce the veterans’ departure on their home stretch from Norfolk to Virginia Beach. Mark Courrier, East Coast SEAL and special warfare combatant-craft crewmen scout, said NS’ participation is a dream come true. “When the 200 cyclists arrive at the station to see an SD60E dressed in all its glory with the red, white, and blue colors, it will be a true testament that Norfolk Southern is making a difference in the lives of our wounded warriors,” he said. The Veterans Locomotive was specially painted to honor the contributions of those who have served in the military and reserves. Over the past six years, Norfolk Southern has hired some 1,300 veterans, and today 14 percent of the total NS workforce—more than 4,200 employees—are veterans and members of the National Guard and Reserves. The graphic billboards are part of Norfolk Southern's Train Your Brain public safety program, which warns motorists and pedestrians of the grave consequences of disregarding railroad signals and trespassing on railroad property. Norfolk Southern is bringing the campaign to East Tennessee – Knoxville, Chattanooga, and the Tri-Cities region -- this year to remind people to use their brains, and be smart and alert around trains. Tennessee was selected because of its high number of train-vehicle crashes and trespassing incidents. In 2012, the state ranked ninth in the nation with 66 highway-rail collisions resulting in four deaths and 18 injuries, while 10 people died and 10 were injured while trespassing on railroad tracks, equipment, and property. In addition to the billboards, the campaign’s mascot, “Brainy,” a giant pink brain, will share information about railroad safety by giving away notebooks, T-shirts, and sports rally towels at state fairs, festivals, and University of Tennessee at Knoxville and Chattanooga football and basketball games. To reach college-aged students, who statistically are more likely to disregard train horns and flashing lights to "beat the train" across the tracks, talk on cell phones, listen to music, and drive aggressively, Train Your Brain messages also will appear in some unexpected places – gas pumps, movie theater screens, and even on frozen billboards (wraps on ice chests at convenience stores). Norfolk Southern launched Train Your Brain in Memphis in 2007, with the Memphis-based marketing communications firm Archer Malmo providing creative support and coordination. Over the past six years, the campaign has run in North Carolina, Indiana, Ohio, and Alabama, reaching more than 800,000 people. For more information, go to brainysworld.com or facebook.com/BrainysWorld. Norfolk Southern also is a longtime supporter of the national highway-rail grade crossing safety campaign, Operation Lifesaver, which works in partnership with railroads and law enforcement and transportation agencies to encourage the public to make safe decisions around tracks and trains.